Home Credit Credit repair Credit Score 4 Credit Myths Busted! Many people see their credit record as a barrier to getting a mortgage or loan or something to fear. This type of thinking is mainly due to a lack of education and understanding as to what your credit is actually for and what can affect it. Of course, we all know that owing lots of money, fraud and not being smart with your credit cards can get you into a lot of trouble. 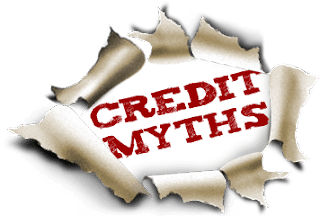 There are a lot of credit myths out there that need to be busted, and it’s due to these myths that fear around credit is even still commonplace. So, let’s go through the most common credit myths and give you the facts that can help reassure you! Myth 1: Paying in cash instead of a credit card is better for your credit. Without proof on a credit card that you have the capability to make repayments, you can expect a mediocre credit score at the very most. Cash doesn’t prove your ability to repay money on time and efficiently, so while it may feel like you are keeping on top of your cash, no one else can see it! The only way you can build up a good credit score, is to have credit accounts. Being able to prove your trustworthiness with credit is going to help you go a long way to showing credit companies like Snappy Loans – and later on, your mortgage provider – that you can make payments reliably. Obviously, if you have issues with control and money then cash is a smart idea, but you need to have built a soft score if you hope to borrow later. Myth 2: Too much credit will hurt your overall credit score. Having lots of cards won’t necessarily hurt your score, as long as you are making the repayments on the cards on time. Being able to manage a larger amount of credit with more than one company can actually make you more desirable in the eyes of a credit agency, so don’t despair if you have more than one card. Just make sure you can afford them! Myth 3: Checking your credit score will damage it. It is well known that there are two types of credit checks. You have a soft search and a hard search and the hard search will leave a ‘footprint’ on your credit rating, where a soft search will not show on your score. You can use sites like this one to check your own credit score without leaving a hard search marker on it. Myth 4: Credit accounts should always be closed after you pay them off. This sounds like a good idea, especially if you don’t want to be tempted into spending any more money. The thing is, closing the account can reduce your overall available credit, meaning your credit worthiness is affected! Keeping the account open and settled means you are showing how trustworthy you can be with money and managing it. These busted myths should go a long way to helping you feel more secure about your credit score and how your credit gets affected.